On the day I like to call Bobby Goldsboro Day, Spoon returned to London and, in their Spoonian way, crushed it. Again. 20-odd years and nine albums into their career, Spoon are a fuss-free rock ‘n’ roll machine. Their songs are sleek, minimal and always brilliantly arranged, and last night they rattled them off in a fury, with several songs segueing into one another most impressively. They began with a great version of Do I Have to Talk You Into It, one of the highlights from new album Hot Thoughts, and any worries we had about the sound in the Forum vanished. When opening act Proper Ornaments were playing, the mix was poor, but in retrospect I think that had mainly to do with the band congesting the midrange with strummed, clanging electric guitars, which drowned out the vocals and made the snare drum a wimpy, barely discernable little tapping noise somewhere in the background. Spoon, by comtrast, are pros, and know how to arrange and play their music. They sounded pretty damn big and settled in straight away, instrumentally and vocally. I always marvel at how good Daniel’s voice sounds live. A bit nasal and congested sounding, more than a little hoarse, his voice would suffer over the course of a long tour, you’d think, with gigs every night for days on end without a break. But no, from the first song he sounded warmed up and ready to go, and his voice remained strong all night, no matter how much he shouted or how often he jumped into his falsetto range. Sara and I had a plan yesterday. Get in the queue early and get seats in the middle of the front row of the balcony so we could see the whole band unobstructed. Everything went exactly to plan, so we had a glorious whole-stage view all night long. While it was hard for me to not watch Jim Eno, my favourite drummer in the world right now, I tried to take in as much as I could of what bassist Rob Pope and guitarist/keyboardist Alex Fischel were up to, too. Pope is hugely impressive. He’s always in the pocket, and even better, he knows how much impact he can have by sitting out for a while and slamming back in during a chorus to make it sound even huger. It’s a neat trick, and he did it several times last night, notably on Can I Sit Next to You (another cracker from Hot Thoughts) and They Want My Soul‘s swaggering, Stonesy Rent I Pay. Daniel was in fiery preacher mode last night. Striking rock-frontman poses and singing I Ain’t the One while lying on his back, he was closer than I’ve seen him get before to winking at the audience, sending up the idea of being the focal point of a big rock ‘n’ roll show. He got away with it, mainly, I think, because Spoon’s music is basically sincere: its occasional forays into pastiche are done with a lot of love, and the band’s enjoyment of playing together and just being Spoon is evident all the time. His excesses seemed enthusiastic, not cynical. Last night they tore through 16 songs, plus three more in the encore, and I was lucky enough to get versions of a lot of favourites: I Turn My Camera On, the astonishing Don’t Make Me a Target, I Summon You (played solo by Daniel as the first song of the encore), Anything You Want (Sara’s favourite, but not at its best last night – the jaunty piano hook wasn’t quite loud enough), Black Like Me, which would have been a brilliant final song, and the menacing My Mathematical Mind, which tore the roof off at the 100 Club; while last night couldn’t match the impact of that eardrum-shattering version, it was still plenty cool, Jim Eno’s backbeat as mean as it needed to be while Fischel pulled all sorts of funny sci-fi noises out of his keyboard. Spoon have been great each time I’ve seen them. At this stage, I can’t think of a band I’d rather see in concert. They’re coming back to the UK in the autumn for more gigs. Get a ticket. 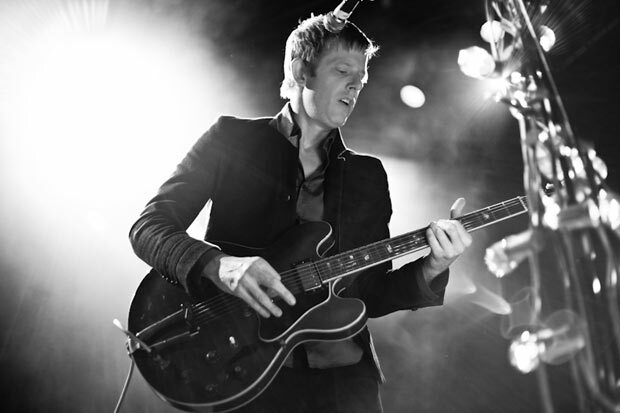 This entry was posted in Music and tagged Alex Fischel, Britt Daniel, gig review, Jim Eno, Kentish Town Forum, O2 Forum, Rob Pope, Spoon, Spoon in London, Spoon Kentish Town, Spoon live review on July 1, 2017 by rossjpalmer.